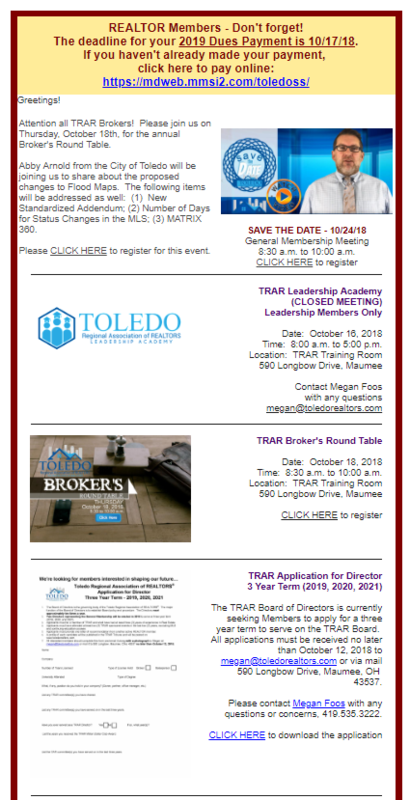 Attention all TRAR Brokers! Please join us on Thursday, October 18th, for the annual Broker’s Round Table. Abby Arnold from the City of Toledo will be joining us to share about the proposed changes to Flood Maps. The following items will be addressed as well: (1) New Standardized Addendum; (2) Number of Days for Status Changes in the MLS; (3) MATRIX 360.